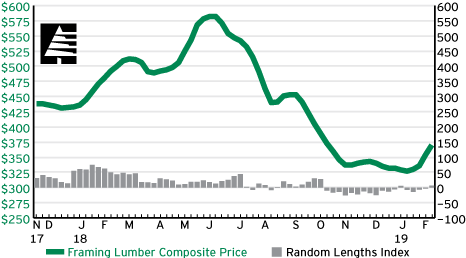 The trading pace in framing lumber eased from the previous week’s action, but early momentum carried prices higher. …Uncertainties regarding 2019 demand, the extent of transportation issues, and limitations from winter weather also contributed to renewed hints of caution. The weight of these issues factored into the about-face in an upward futures trend. Even so, early week gains pushed the Random Lengths Framing Lumber Composite Price up $16, to $370. …Structural panel sales slowed from the previous week, but prices remained on a firm footing. Wintry weather limited OSB sales in some markets, but prices maintained a firm-to-higher track. In the South, sales lagged last week’s pace, but sparse mill offerings kept prices on a gradual climb.